FKB29 is a 2018 Treasure Hunt and 3/5 in the Dino Riders series. It is blue with yellow and orange wide stripes, black & silver slash marks, and dinosaur graphics. 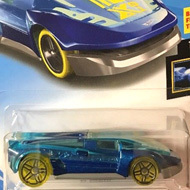 The low production symbol and the Hot Wheels logo can be found on the sides of the car. It has red tinted windows, brown Off-Road Beadlock wheels with yellow details, and an orange plastic Malaysia base. 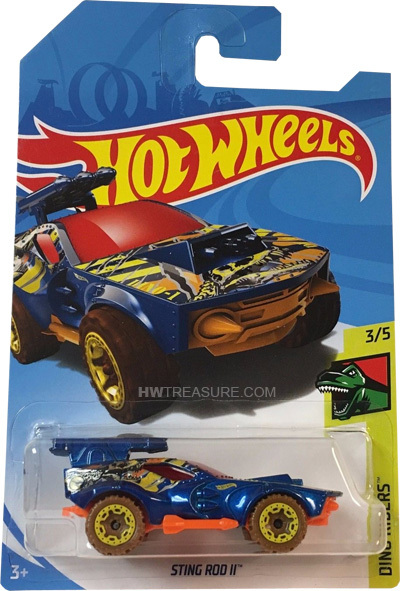 This vehicle can be found in mix “A” of 2018 Hot Wheels mainline cases. Sting Rod II made its debut in the 2010 New Models series. It was previously a Treasure Hunt in 2013.